The Pom Pom Crab, Lybia sp., has a light tan color with darker markings throughout it’s body which are used as camouflage. This Hawaii native crab, from the Xanthidae family, carries a small anemone in each of it’s claws. These anemones serve two main functions. First, they are used for defensive purposes, threatening any potential predators with the risk of a sting. Second, these anemones are used to to “mop” uneaten food from the substrate and rock. It should be noted that when adding this generally peaceful tenant to a reef tank, one runs the risk of the anemones stinging corals. Although, any damage cause by these anemones would be minimal due to their size. Another common name for this crab is a Boxer Crab, and will grow to a maximum length of about an inch. As with many crabs and shrimp, molting is a mechanism used for growth, and therefor proper iodine levels should be maintained. 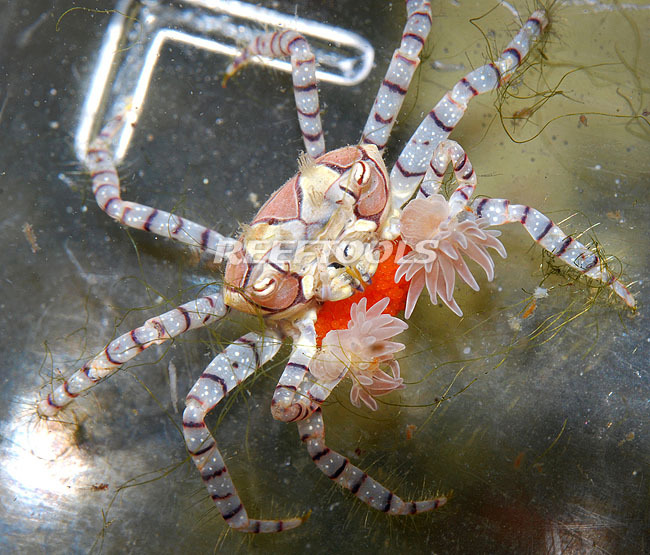 The Pom Pom crab should have a diet consisting of meaty foods such as mysis shrimp. chopped fish and clams, with the occasional addition of Spirulina or Nori.